No change at the top, but where does everyone else lie? 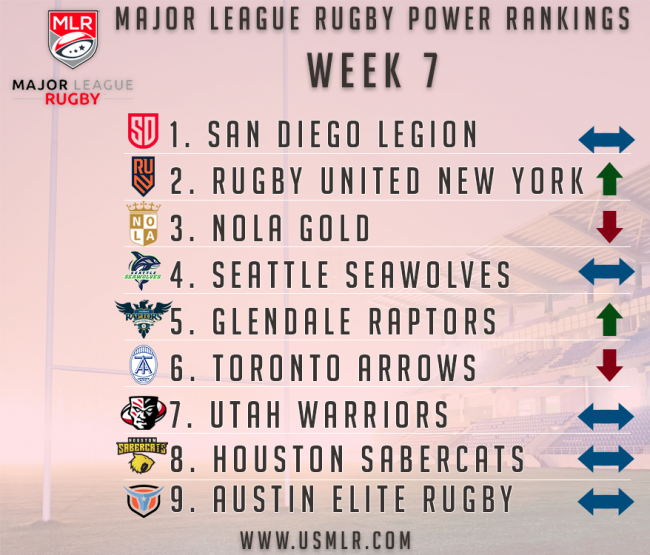 The San Diego Legion, despite not having a game last weekend, became the first team to hold on to the top spot in the power rankings for consecutive weeks. They have Rugby United New York, nipping, at their heels, after their impressive performance against the Houston SaberCats. NOLA Gold, former occupants of the second slot, were bumped down to third after edging out the Utah Warriors, in a tight two-point decision. The Seattle Seawolves remains in fourth. Also moving up in the rankings were Glendale who surpassed the Toronto Arrows for 5th, after they controlled the snowy conditions with greater efficency. Utah, Houston and Austin Elite Rugby remained stationary in the seven through nine spots.